Despite my best intentions I have not been blogging as frequently as I would have liked. Funny how life seems to keep getting in the way. Dare I say that I think Spring is now really and truly here? The snowdrops have come and gone and many of the daffodils, hyacinths, and tulips are already past their prime. Fruit trees are beginning to blossom, while others are putting out new leaves of yellow-green. And best of all, it is now possible to go out with only a light jacket, or sometimes with no jacket at all. With the new season finally taking hold I feel as though I am emerging from a “long winter’s nap” and am anxious to shake off the sluggish feeling and get moving again. This morning I exercised for the first time in a very long time and it felt good to work up a sweat and stretch my muscles. I have a love/hate relationship with working out and don’t do it as consistently as I should. I love the way it makes me look and feel but I resent the time it takes away from more enjoyable pursuits, like knitting. 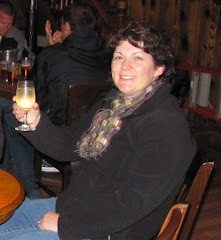 Still, if my soon-to-be-48-year-old sister can run the Boston Marathon for the second year in a row (Yay, Jacqueline! ), I figure I can go for a walk or ride the stationary bike a few times a week. As for knitting, I am still in a shawl phase and began my Year of Lace fall kit, the Silver Birches Shawl (Ravelry link). I know I should finish my summer kit first but it’s just not speaking to me right now. 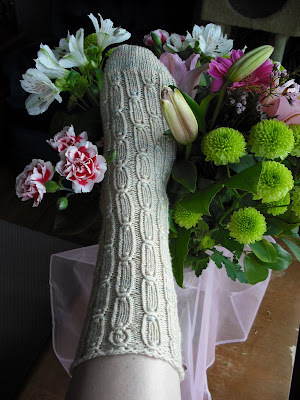 I did one pattern repeat on the Embrace the Lace kit, just for the experience, then handed the project over to Jessica. The stole is more her style than mine and I thought she might enjoy knitting it herself. 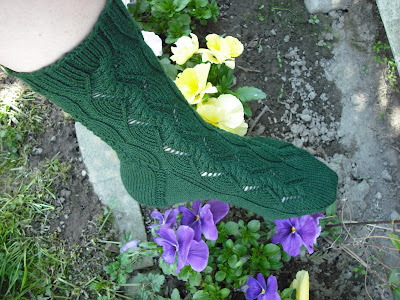 After largely ignoring the Ivy socks for most of March and April, I devoted several days last week to finishing them up. I am really happy with how they turned out and hope that Jacqueline likes them as well since I am sending them to her for her upcoming birthday. April’s SKA project is going much more quickly and I finished the first Margaritaville sock yesterday morning, before heading home from a four-day getaway to Wendover. 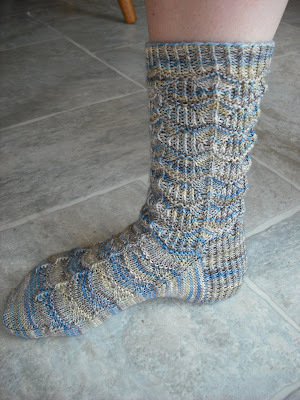 I’ve also been working on several pairs of non-SKA socks, like these Punctuated Rib socks from Knitting Socks with Handpainted Yarns, and resisting casting on even more. It's nice to be missed--these flowers are a welcome home bouquet from Cameron. 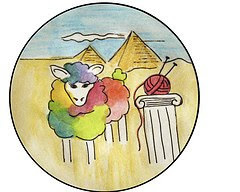 Of course, all of this other knitting and travel is keeping me away from the GAAA and I am about five blocks behind on my proposed schedule of two blocks per month. It’s time to get back on track with that too before I blink and it’s Winter again.